hours and maybe come back next year and try to better that distance. I love the concept!!!" (or those pretty oat-like weeds along the shore). 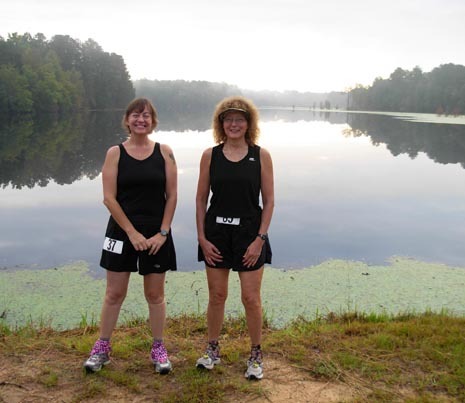 The Hinson Lake 24-hour run is a jewel that is growing by leaps and bounds as runners hear about it. Registration has roughly doubled in each of the three years since the race began, with 163 entrants this year and 138 of them toeing the line at 8 AM on Saturday, September 27. One man introduced himself to me before the race and told me he was running it this year because of my photos from last year. Wow. That felt good! I'm very happy to promote excellent-but-not-well-known races like this on our web site, our Picasa photo-sharing site, and the internet ultra list. While I was helping the Gabell family members and in-laws in the timing tent Saturday evening I asked Tom how much larger he'd let the race grow. He said that he's comfortable with allowing even more entrants next year because the race was going so smoothly this year. The runners quickly get spread out on the 1.52-mile loop course. After the first couple of laps, there isn't even a "bubble" at the aid station. In addition, not everyone is on the course at all times, as explained below. 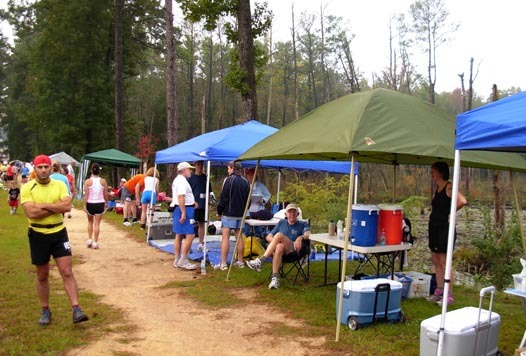 The main problem I see with additional runners is increased difficulty with parking, but other race logistics at Hinson Lake can handle an influx of runners. 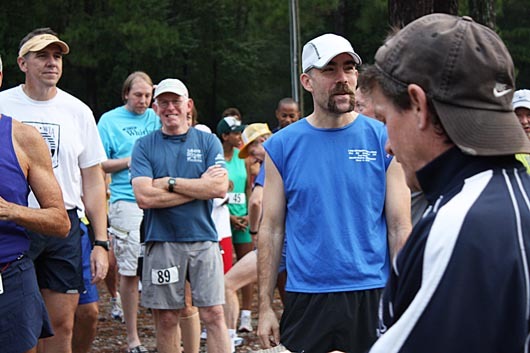 Race rules require that everyone who is going to put in any distance must begin before the first runner completes the first lap at the beginning of the race; after one loop, a runner can stop and re-start at any time. Some people choose to run and walk the entire 24 hours. Some take a nap during the night. Some have a specific time or distance in mind, such as ten miles or a marathon or 50 miles, and stop when they reach their goal. 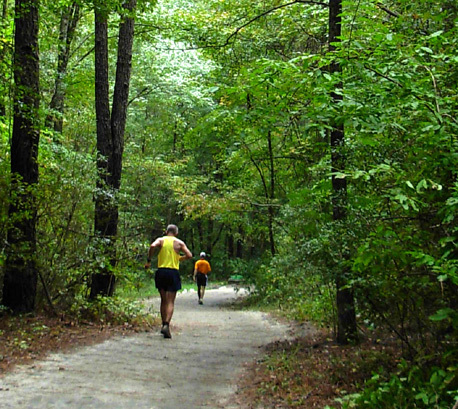 A few runners do one or several laps, stop during the heat of the day, then resume running at night when it's cooler or for practice running in the dark. And so on. There are many variations, and Tom believes they are all valid. If you look at the results from 2007 and 2008 on the web site, you'll see the wide variety of laps / mileages that are run. So even though almost 140 people began the race this year, the only time they were all on the course at the same time was during the first lap on Saturday morning. And even then, they quickly spread out. I've never experienced any congestion in this race. The trails and bridges are wide and so far the participants have been pretty conscientious about leaving room for faster runners to pass. 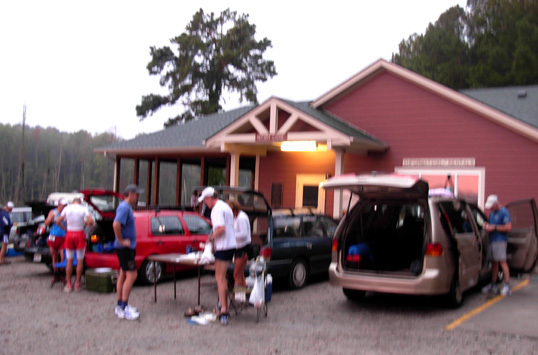 In fact, the only runner "congestion" I saw was at the aid station when the pizzas arrived at suppertime on Saturday! The pizzas were very popular again this year. 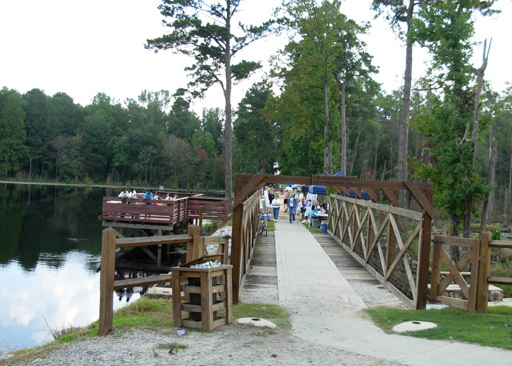 I described the Rockingham, NC city park where the race is held in more detail last year. I'm including some of that information again so you'll have a good idea of what the course is like and can understand the locations of the photos better. There are additional pictures on our Picasa site. Below is a partial map of the park. It shows most of the lake and all of the trail we used in the race. 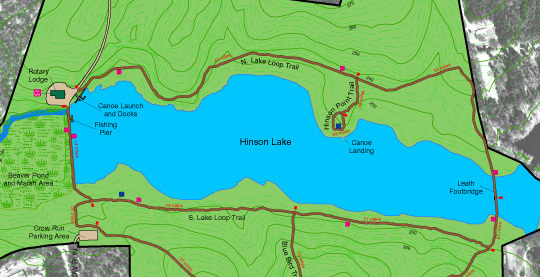 The course incorporates the Lake Loop Trail, the red lines below that are closest to the lake. The Rotary Lodge and main parking area are in the upper left corner. Last year runners couldn't park there until a class reunion vacated the premises on Saturday afternoon. This year we had the place to ourselves and runners who wanted to make a serious attempt at running 24 hours were allowed to park there. It was great having our vehicle so close to the start/finish area this time. 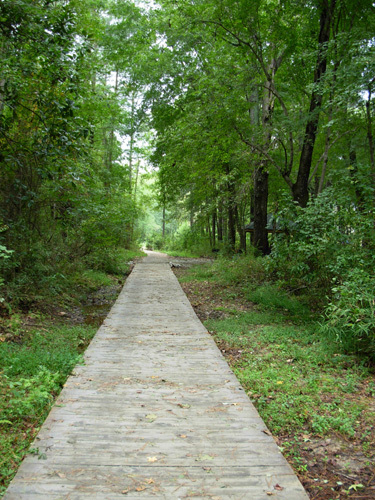 Now follow the Lake Loop Trail CCW around the lake. 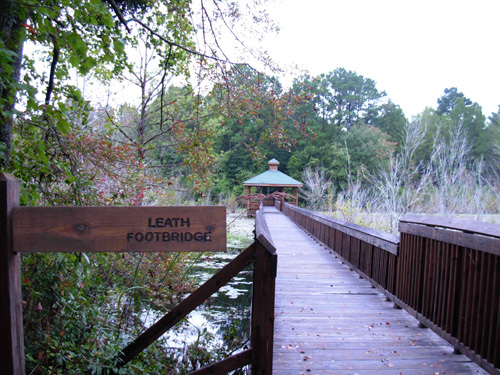 At the right lower corner it turns north toward the 300-foot long Leath Footbridge, which crosses a marsh full of lily pads, other aquatic plants, and trees that love to have their feet wet. The trail continues north to the upper right side of the map, then turns left (west) back toward the lodge. That whole loop is the 1.52-mile course for this race -- repeated as many times as you can or want in 24 hours. I should add that the course is pretty flat but has enough elevation gain and loss to use some different muscles. 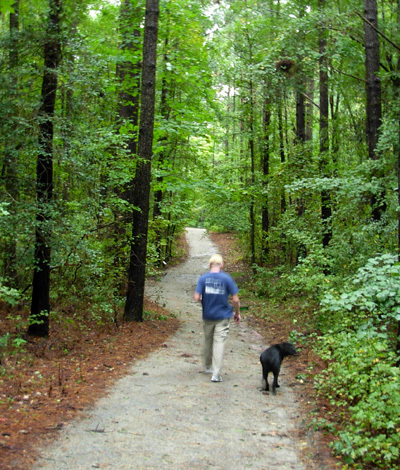 It's flatter than Umstead but has more rise and fall than Across the Years, e.g. Last year the course was bone dry; the area was in an extended drought. The trail was perfectly groomed and the only complaint one could have with it was the fine grit that worked its way into runners' shoes, even if they wore gaiters. "Even with the recent 10 inches of rain, the course is very runnable. Almost no hills and no roots or rocks to trip over. There is a little water on a couple of spots on the course but hopefully it will be dry by Saturday." Only one spot was a muddy mess. Despite the dreary sky and morning fog, we lucked out and didn't get any rain during the entire race. The course remained wet, however. 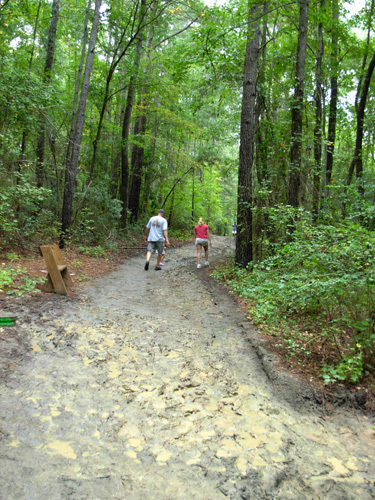 There was a lot of drainage on the sloped trail all day Saturday but no puddles to dodge. 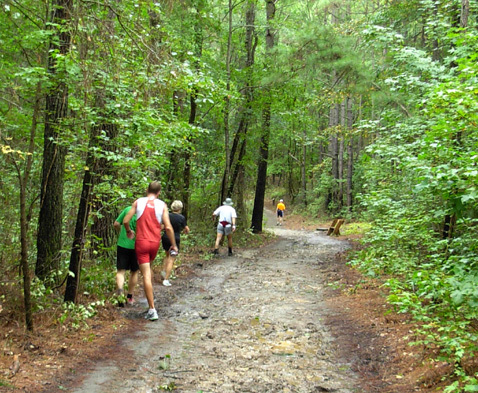 The mud pit and renegade trail continued to deteriorate throughout the race. I took the photos above about eight hours into the race. Jim said it was increasingly worse throughout the night. At least it didn't rain any more during the race. I'm not whining, just comparing the course with last year. Jim and I have run some VERY muddy races before. We vividly remember ankle- and calf-deep muck at Sunmart (AKA Mudmart) in Texas, the Bighorn Mountain Wild & Scenic ultras in Wyoming, Chuckanut (AKA Muck-a-Nut) in Washington state, even thigh-deep frozen swamps at Alferd Packer Double Marathon in Colorado . . . no, this wasn't bad in comparison! This year's race was cooler than last year during the day (high of 78� F. in Rockingham on Saturday), warmer at night (64� F.), less windy, and MUCH more humid (90-100%). The sun did peek out briefly a few times on Saturday afternoon but it was mostly overcast during the race. The stifling humidity was a topic of conversation among those of us who are adversely affected by that sort of thing. 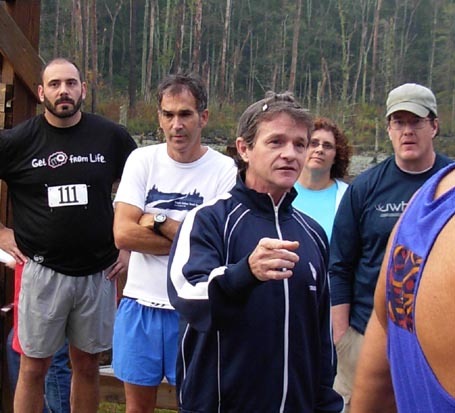 The last training update I wrote about both Jim and me was on September 11. 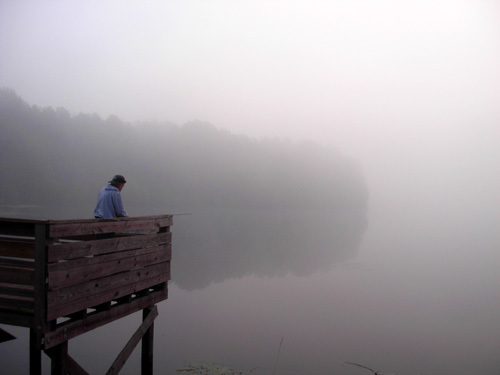 Jim did a long run of 30 miles a day or two after that, then tapered a bit for Hinson Lake. This was to be a "practice" race like last year. 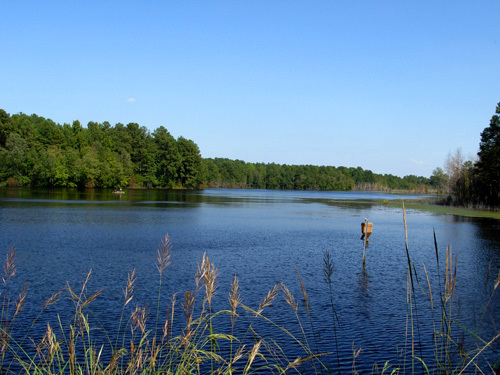 His original goal for Hinson Lake was to run and walk his planned distance (87 miles) for the first day of his 48-hour race at Across the Years (ATY) at the end of December. He also wanted to practice sleeping for about three hours and getting back out on the course; at ATY he intends to nap two or three times. 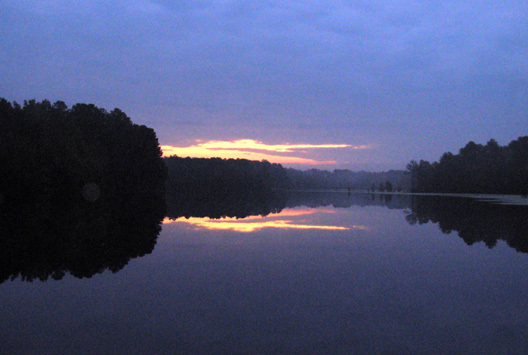 We know from other multi-day runners that it can be mighty difficult to get moving again after a sleep break, so Hinson Lake would be a good test. 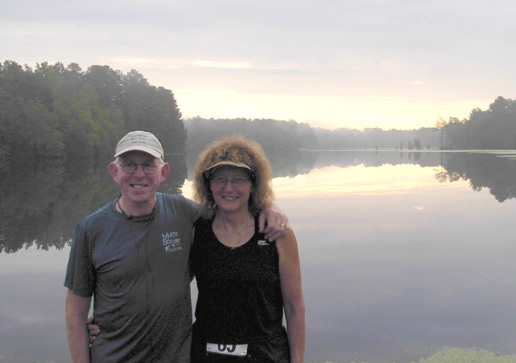 Jim and I had several discussions about the advisability of that 87 miles the last couple of weeks before Hinson Lake, mostly that it might be too big of a leap from his last long run of 30 miles. There's always a fine line between pushing your body far enough that you benefit from the training effect -- and getting injured because you pushed too far. That's especially more likely to happen when one is age 60 than age 35! Jim decided somewhere between 100K and 75 miles might be more wise at this point. He can aim for 87 miles at Ultracentric in mid-November when he has a bigger mileage base and he's closer to running ATY. Jim and me a few minutes before the race started. Photo by Lynn DiFiore. I think making this decision took a load off his mind before Hinson Lake and he was able to have a great run there. To cut to the chase, he ran within a hair of 71 miles and was off the course for over four hours to sleep, etc. He felt good when he returned to the course the last few hours. More about his race later. 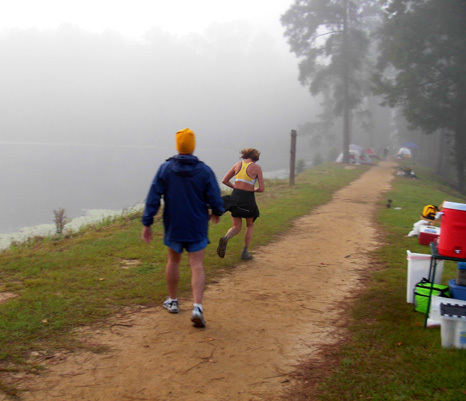 As explained in the September 11 entry, my plan was to use Hinson Lake as a training run for the New River Trail 50K two weeks later. Although I had some well-paced long runs up to 23 miles on the greenway and a great 15�-mile training run on the NRT course September 17, I still wanted reassurance that I could run 32 miles in seven hours (about a 13-minute per mile average, including stops). 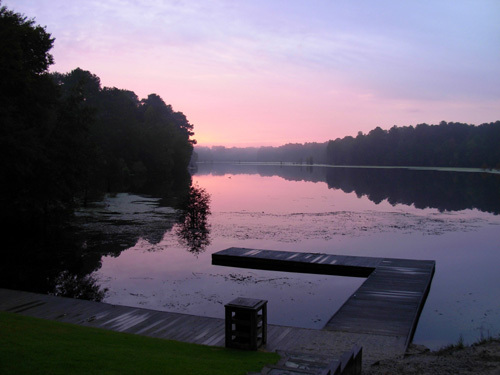 That was my goal at Hinson Lake. Well, apparently I was a little too exuberant during that run on the New River Trail and/or I didn't taper adequately for Hinson Lake because I didn't meet my time goal. All my enthusiasm and optimism for Hinson lake couldn't compensate for my dead legs! They just never felt good during the race, even after my muscles got warmed up. I accomplished my goal of running and walking 32 miles OK but it took longer than I planned. It was still raining Friday afternoon when Jim and I arrived in Rockingham. We were able to check into our motel early and spent a couple hours watching the drama of the evolving U.S. financial meltdown and congressional "bailout of Wall Street" on TV while waiting until closer to packet pick-up to go over to the park. When we got to the park at 5 PM to walk the course with Cody (above), the rain had stopped. We discussed where we wanted to put the canopy for our personal aid during the race (decision: same place as last year). 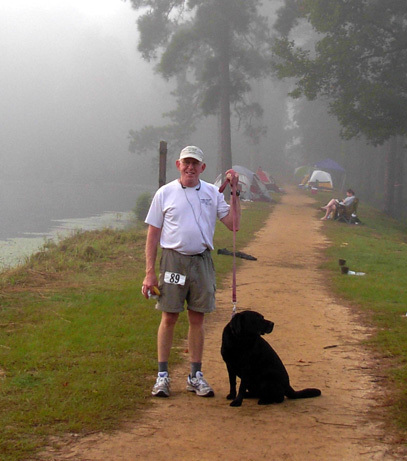 Jim carried the GPS so he could mentally note the location of � mile and one mile on the loop to help with pacing. 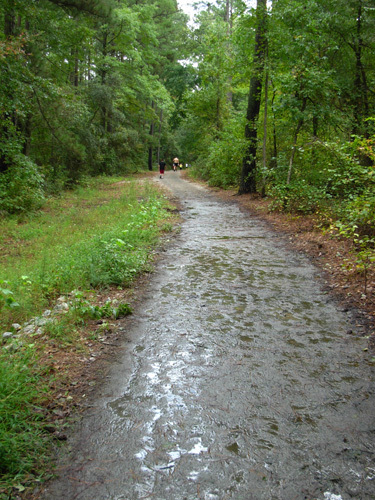 We dodged the puddles and the long muddy area, wondering what the trail would be like during the race. We knew it would be more challenging than last year, especially if it continued to rain during the race. We got our race numbers and shirts, then talked with Tom and several runners for a while before heading back to the motel for supper in our room, more TV, and a poor night's sleep. Our room was fine and we couldn't hear any noise with our ear plugs in, but neither of us slept well. We probably should have kept the TV off and just read something relaxing. Over-stimulation was part of the problem -- all the political and financial turmoil, the first McCain-Obama presidential debate, etc. Knowing it was raining again didn't help, either. 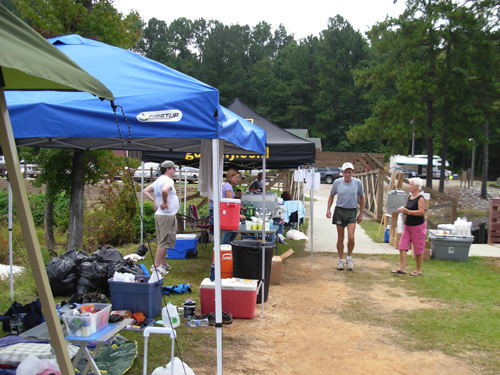 Several volunteers had already arrived and were putting up the two canopies for the timing tent and official aid station. Jim and I were among the first runners to arrive other than the ones who slept there in their vehicles overnight. There were several parking spots available near the lodge, about 75 feet off the trail. 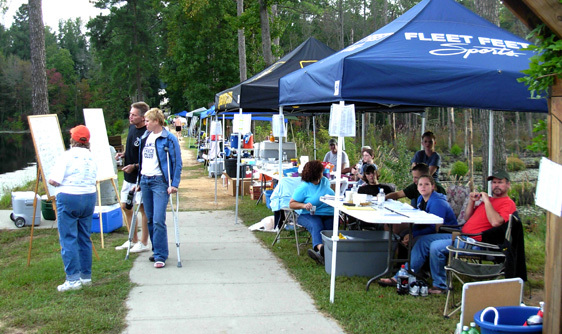 Some runners set up their crewing chairs, tables, and other equipment and supplies behind their vehicles. Jim and I kept Cody-pup in the van during the day (with the windows down and back gate open) and checked on him most laps. Jim at our van (R) before the race; Quatro Hubbard (blue shirt) talks with Scott Brockmeier and Liz Bauer. We were early enough to score our favorite self-crewing spot one canopy past the aid station -- it's flatter and wider than most other places at this end of the dam. We wanted to be close to the start/finish area and lodge because I'd be working the timing tent during the night; it was nice to be close to our supplies (and Cody, who slept there after I finished running) in case Jim needed crewing assistance. We put up our canopy first, then carried our equipment and supplies about 250-300 feet from the van. We were grateful it wasn't raining -- or as windy as last year. One of the best things about this race -- and most other ultras -- is socializing with old friends and meeting new friends. 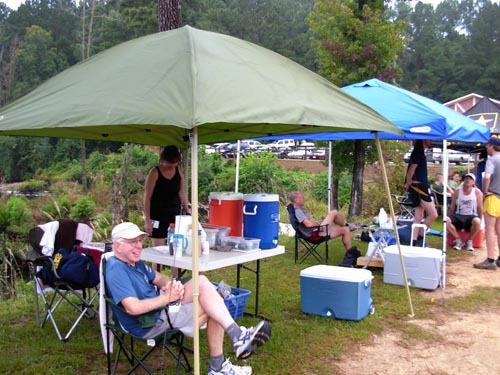 We were happy when Joe and Hannah Lugiano set up their canopy just past ours (in photo above, Jim is sitting under our green canopy and Joe is standing near him in the blue shorts and white shirt). We hadn't seen the Lugianos since the race last year. Unfortunately, we didn't have much time to talk to them before they left in the evening. 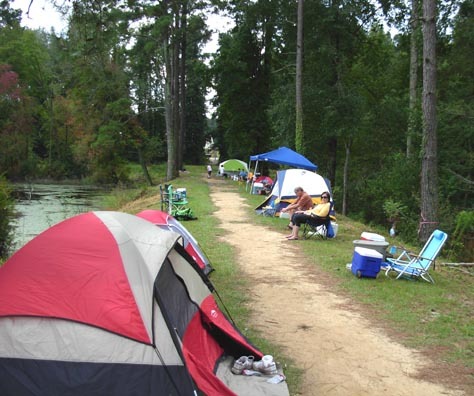 We used much of the same equipment that worked for us at this race last year -- the green canopy, a four-foot table, two comfortable chairs, a lightweight battery-operated camping light for at night, a large hard-sided cooler on wheels, and two 5-gallon water coolers we borrowed from Jim's Rescue Squad. You can see our setup in the next photo. Our other equipment and supplies are the same ones we put in drop bags or our crew vehicle at just about any ultra. Jim chills out before the race (smart fella!) while Lynn organizes her drop bag and I take photos. We kept several bottles of freshly-made Perpetuem cold in our food cooler, along with a few servings of V-8, Sam's Club's version of Boost, milk, Starbucks frappuccino, and Jim's soft drinks. I drank concentrated Perp chased down with ice water the 8+ hours I ran, supplemented with a side of raspberry Hammergel. The sodium in a small can of V-8 during the afternoon tasted good, too. Jim drank Perp for about nine hours, then switched to Heed, V-8, and ginger alel. He also drank caffeinated coffee and some Coke in the early morning hours after his nap. He saved his caffeinated espresso Hammergel for the night time and used chocolate gel during the day. I just put that in there to keep you awake! Although Jim did throw up once late in the race when he gagged on two electrolyte capsules, neither of us had stomach problems while we were running. We DID lose our cookies, however. We took plenty of "real food" with us like yogurt, bananas, tangerines, apples, cereal, cookies, Pringles, sandwiches, and other solid foods to eat during the race, when we got done running, and for the four-hour drive home on Sunday. Somehow, somewhere at the race we misplaced two plastic Wal-Mart bags with a large container of cookies, several bananas, half a dozen Clementine tangerines, and a package of saltine crackers. We really missed 'em, too! 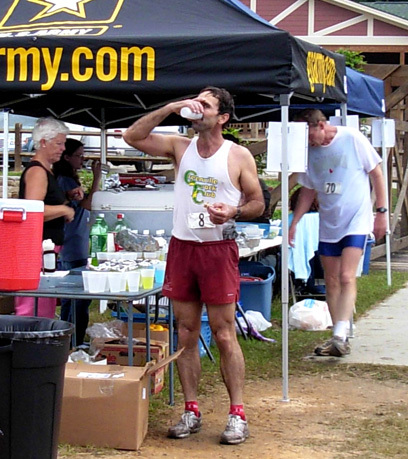 Bryon Backer gets some fluids from the aid station. That's our favorite Lieutenant Colonel on the left (Fred "Doom" Dummar). Jim is #89 in the blue-gray shirt and Tom-the-RD is in the navy jacket on the far right (we don't know the name of the guy in the blue shirt). A few minutes after 8 AM, Tom had us walk over the bridge to the timing table and said "GO!" It was time to get this show on the road, er, trail. Since the large group of runners was still walking fifty feet later when we got to our canopy, I left my camera there and took it on only two subsequent laps later in the day when I was doing more walking than running. Most of the photos of the course and people are from before the race and after I stopped running late in the the afternoon. I never did catch a picture of Jim running! It didn't take long for the runners to spread out. Although we occasionally ran or walked with other folks for short periods of time, both Jim and I were running alone most of the time. We never did run with each other and we'd go for a couple hours at a time without even seeing each other because of our different paces or when one of us would be off-course to walk Cody or go to the bathroom. I had high hopes for this race -- 50K (31.2 miles) in seven hours -- which meant running a comfortable, steady pace and not walking very much or spending too much time at our canopy. I needed to maintain a 13:27 per mile pace including all stops for any reason: getting fluids and calories, going to the bathroom, changing shoes or socks, checking in on Cody, etc. And since 20 laps comes up short of 31.2 miles, I'd need to do 21 laps (31.92 miles). That meant each 1.52-mile lap, including stops, should average about 20 minutes. My overly-optimistic goal was to run almost all of each lap at a comfortable, go-all-day pace of about 10:15 to 10:30 minutes per mile, walk about a tenth of a mile before and after the start/finish area, get needed fluids and calories at our canopy (I didn't carry a bottle most of the time), then repeat over and over. That worked for exactly two laps (three miles). <sigh> Then I had to start walking more when I realized how dead my legs felt. After an hour my muscles should have been all warmed up and I should have been in my happy zone. I did enjoy the camaraderie and the scenery but I can't say I enjoyed any of the running that day. It came as a shock because my training runs had gone so well. I'll analyze what I think went wrong in the next journal entry. Despite one shoe change, a blister repair, and stopping at the car and canopy frequently, I managed to run ten laps -- 15.2 miles (not quite half of a 50K) -- in 3:20 hours. I should have run it at least 20 minutes faster (an entire lap) in order to get 31+ miles in seven hours, like I have to do at the New River race. That discouraged me a lot and I deliberately slowed down even more. I walked most of the 11th and 12th laps, then found some new energy to fight the rising heat of the afternoon. I ran much of the remaining nine laps (for a total of 31.92 miles) but I took more time taking pictures, walking and feeding Cody, and hanging out at the canopy. I completed only 27+ miles in seven hours, not 31 or 32 miles. I'm still optimistic that I can finish the New River Trail 50K in under seven hours if I rest sufficiently between now and then, and if the weather is cool and dry. I won't have nearly as many distractions and aid station stops there. Jim was two or three laps ahead of me by the time I stopped running at 4:40 PM. He was keeping a steady pace throughout the day, aiming to run and walk each loop in about 23 minutes, including stops at the canopy (he didn't carry fluids either), bathroom breaks, a change of shoes and socks, and saying hi to Cody in the car about every lap (Jim liked the excuse to walk over there, too!). Jim ran his first laps in 18-20 minutes, which was faster than he needed to be going. It was several hours before he slowed down to the 23-minute goal lap time. After 8 or 9 PM he slowed down to about 27 minutes per lap, a natural reaction to the darkness and his increasing fatigue. While I was still on the course but not seeing Jim very often, I could track his progress on the split sheet he kept as he passed the canopy each time. He is much more organized in this manner than I am. He printed out his intended splits for each lap up to 100 miles, then recorded his actual times by hand during the race (not on every lap). I did the math for my own run in my head, much as I did at ATY last year. Hey, it worked that time! 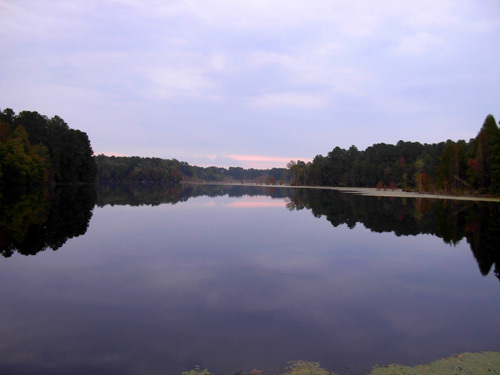 I knew I needed to do a minimum of three laps (4.5+ miles) per hour for seven hours at Hinson Lake. I also knew before half way that I wasn't on pace, but I couldn't make my legs go any faster. The only color when the sun set was to the east, not the west. By the time I stopped running, Jim was getting tired of Perpetuem and had just one remaining energy drink bottle mixed up and chilled. I made him a couple bottles of Heed with ice for a little variety and set out a cold can of V-8 -- those are always good in a warm, muggy race. Jim really didn't need me to do much crewing. Everything was within easy reach and he pretty much took care of himself. He'll have to do the same at Ultracentric and ATY, so that was also good practice. I got cleaned up as best as I could in the bathroom at the lodge and sprung Cody from the van. It wasn't as confining or lonely there as it sounds! He had plenty of room, air circulation, water, food, walks, and attention from other runners and crews. He spent the rest of the race under our canopy, tethered so he couldn't reach the runners on the trail but they could come in and pet him if they wanted; he loved all the attention he got! Our friend Quatro wanted to take him out for a loop but I discouraged it because I didn't think Cody could keep up with Quatro in the heat of the afternoon. Leashed dogs are allowed in the park and at least two other runners besides Jim took a well-behaved pooch on a loop when the runners were all spread out. Jim took Cody with him once on Saturday morning when it was still cool and again on his last loop early Sunday morning. By now (about 5:30 PM) I was pretty hungry and ready for some solid food. I supplemented food we brought with some warm potato wedges and real roasted turkey breast (not sliced or processed) from the aid station, crewed for Jim, took photos of runners going by, and relaxed for a couple of hours. I had a great view of oncoming runners from the vantage point of our canopy. There's Bill Keane. It was comical when about a dozen pizzas were delivered to the aid station at suppertime. Runners (and volunteers) came out of the woodwork to surround the table! There was bit of a feeding frenzy for the next half hour as each runner came back through the start/finish area at the end of a lap and heard there was pizza. Jim sat down to eat three slices; he was ravenous by that time. I don't think I could have run with all that solid food in my stomach, but he's used to doing it. From about 7 to 10 PM, I helped with timing. It was a lot of fun to encourage the runners and to work with Tom, his extended family, and a couple of non-related volunteers who manned the timing tent and aid station. Each timer kept track of about 25 runners who were still in the race, letting each one know which lap they'd just completed. The race doesn't use chip timing. As freely as runners can come and go, I don't think chips would work here unless the rules were more rigid. Every hour we'd help Tom re-write the men's and women's top ten "leader boards" so runners could see how they stood. There were also lists posted so runners could convert laps to miles. It was fun when runners reached their distance goals, such as 50 miles or 100K, and happily announced they were done. Eighty-three runners completed ultra distances (50K or longer), but only 35 of those went beyond 60 miles. Some of them took naps, like Jim, so there weren't a lot of runners on the course between midnight and sunrise. Timing tent and volunteers (R). Hannah Lugiano (L) and Susan Dummar (on crutches) check out the leader boards during the afternoon on Saturday. Susan has a stress fracture and couldn't start the race. Like most trail ultras, this course isn't lit up at night. Because of the heavy cloud cover almost everyone needed to carry a light after dark. 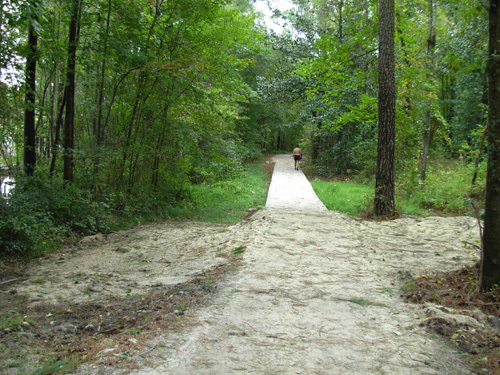 The trail surface is very light-colored in many places so even with all the leafy trees, if the sky is clear like last year lights aren't mandatory on this course. Jim's plan was to lie down for a few hours in the van when he got sleepy, not at a particular time or after a certain number of miles. It was good advice he received from some multi-day runners who learned this trick the hard way. And it worked beautifully for him, at least in this 24-hour race. About 11 PM Jim told me he was ready to go to sleep. He'd been on the course for 15 hours and had completed 36 laps (54.72 miles, an average pace of about 16:26 minutes per mile). That was a good pace, considering all his stops at the canopy, potty breaks, a shoe and sock change, and time with Cody. He said goodnight and went to the lodge to clean up a little in the bathroom before hunkering down in a sleeping bag in the van. The parking lot was brightly lit all night but a towel over his head for darkness and ear plugs in his ears to mute any noises helped him sleep well for over three hours. He woke up on his own a little before his alarm was set to go off. 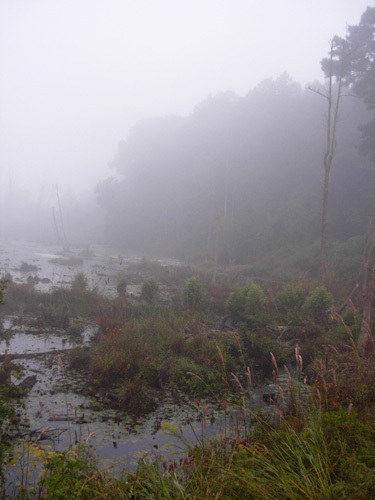 By now the lake and beaver pond (below) on either side of the canopy were shrouded in fog and it was getting rather chilly for crew members and volunteers who weren't circling the lake like the runners were. After Jim laid down I asked Tom if he needed help. The timers all said they were good, so I decided to take a nap myself. That didn't work out as well for me as it did for Jim. There wasn't room in the van for all three of us so I opted to sleep in one of our chairs under the canopy with Cody lying next to me on a blanket on the ground. I couldn't get comfortable scrunched down in the chair with my legs propped up on the cooler. I was cold despite several layers of clothes and a thick fleece blanket, but I did fall asleep for at least an hour. Most of the time I was pretending to sleep in hopes I'd doze off. I should have taken the other sleeping bag and pad to the canopy and slept on the ground; it would have been more comfortable. Thank goodness it wasn't windy or raining. I knew Jim set his alarm for 3:30 AM and wanted to be back out on the course by 4. I was partially awake and saw 3 AM on my watch. I knew I should be awake around 3:45 to go check to make sure Jim was up. About 3:15 AM something woke me from my half-sleep. I opened my eyes and was surprised to see Jim standing a few feet in front of me. We sort of startled each other! He was trying to get a drink from the cooler without waking me up. He was up early, refreshed and ready to get back out on the course. His sleep experiment worked very well. After assuring me that he was able to crew himself the rest of the race, he encouraged me to go sleep in the van. He had set the alarm for 7 AM so I could watch the end of the race. Cody was sleeping well under the canopy and Jim wanted his company at the end of each lap, so I "let the sleeping dog lie." I kissed Jim goodnight and wished him luck, cleaned up a little in the bathroom (brushing my teeth was wonderful!! ), laid down in the sleeping bag in the van, and was asleep in, oh, about ten seconds. Meanwhile, Jim continued running and walking another nine laps around the lake before I got back out to the canopy a little after 7 AM. He felt good after his nap and was able to resume a good pace. He was running and walking each lap in about 23 minutes, his original goal. His stomach was behaving well (that's often a problem, but not this race), his feet were good until the last couple of laps, and he still had energy and a good attitude. While he went out on his 46th lap, the last full one that would count toward his mileage, I started packing up our belongings and carrying them to the van. 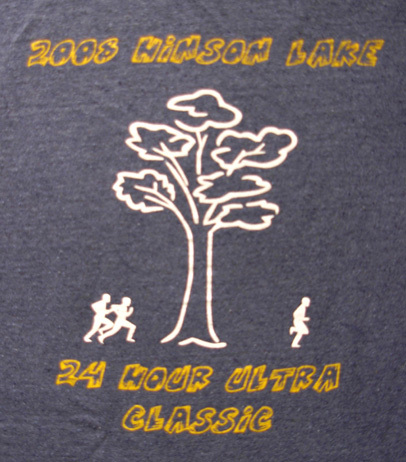 At Hinson Lake runners have a choice whether to stop running after their last full lap before the clock hits 24 hours, or continue for a partial lap that will be added to their mileage total. About half an hour before the end of the race, Tom starts asking the runners if they are going out on another loop. If there's a good chance the runner won't make it all the way around the loop before the 8 AM finish, someone writes the runner's name on a banana. The runner drops the banana on the trail when Tom sounds a horn that can be heard around the lake. Tom and one or more volunteers circle the lake, recording the distance of each runner's banana location. And they bring all those bananas back, of course! Seems to me that a CD or something small would be more practical, but hey, I'm not the race director. About fifteen minutes before the final cut-off Jim came into the finish area, got a banana with his name written on it, put Cody on his leash, and patiently posed so I could finally get a photo of him on the course. Then he and Cody set off on their final lap. When Jim heard Tom's truck horn he dropped his banana at precisely 1.02 miles into the course. Since he was more than halfway around the loop, he continued around to the finish. His official 24-hour race distance was 70.94 miles. Including all of his time off-course for every reason, including a nap, his average pace was 20:18. He had an average of 16:28 minutes per mile for 19� hours on-course, including all stops except the sleep break. Jim really ran and walked a total of 47 laps for 71.44 miles, plus additional distance to see Cody in the car about 30 times and go to the bathroom on the back side of the lodge. The first man and woman are the only runners who receive an award after the race. Tom keeps the presentation very simple. Many runners had already left by the time runners returned from their partial loops. I was busy carrying our equipment and supplies back to the van and didn't even see Tom give Liz Bauer and training partner Scott Brockmeier their metal sculptures for their decisive wins (see results here), although we talked with them after the race since they were parked next to us. Liz Bauer (yellow top) and another runner head out on their last partial lap Sunday morning. Liz won the women's race and placed third overall with 114 miles in 24 hours. I visited with other remaining runners while Jim changed clothes in the restroom. Then we headed home. As soon as we got out of the park, the fog was gone and we entered into a world with blue sky! The fog we'd been in for the last fourteen hours was simply lake-effect moisture. It's always a weird sensation when you pass through that "barrier" near a river, lake, or beach. Even though Jim had just run and walked more than double the distance of his longest training run in the last five months, he felt good enough to drive more than half way home on Sunday morning. We did take nice long naps in our own comfy bed that afternoon, however. We talked all the way home about the great time we had with our friends during the race and our plans for training and racing this fall and winter. The country's economic tailspin was the last thing on our minds for at least two days. Thank goodness for diversions like running.